Camera: Canon EOS 400D; Lens: Canon EF 80-200mm f/2.8L zoom; Focal Length: 127mm; Shutter Speed: 1/1250; Aperture: f/2.8; ISO: 400. Baby elephants remain in almost constant contact with their mothers. 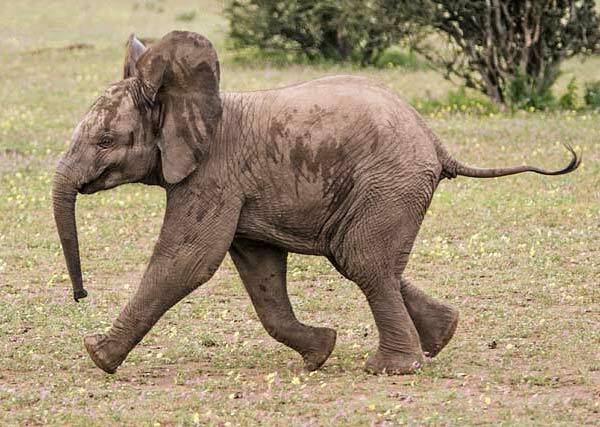 Should a young calf wander more than 10 to 15 meters away, the mother will go after it. However, as the calf develops, the bond gradually changes to one of leader-follower relationship and the burden of keeping in close contact with the mother shifts to the calf. At this stage, should the calf wander off, as soon as it realizes its situation it hurries back to join its mother, as in the photo above.